Expert attorneys and speakers gathered recently in Samford University’s John L. Carroll Moot Court Room to discuss issues of school safety and civil liability in the context of bullying at the Cumberland Law Review Symposium. Speakers included James Gallini, Attorney Adele P. Kimmel and Tina Meier. Gallini is a co-founder of The Gallini Group in Birmingham and the father of an autistic daughter. He spoke on how to properly advocate for students with special needs and maintain positive relationships with the school systems. Gallini offered the unique perspective of a parent of an autistic child, and addressed the many issues of dealing with special education law. 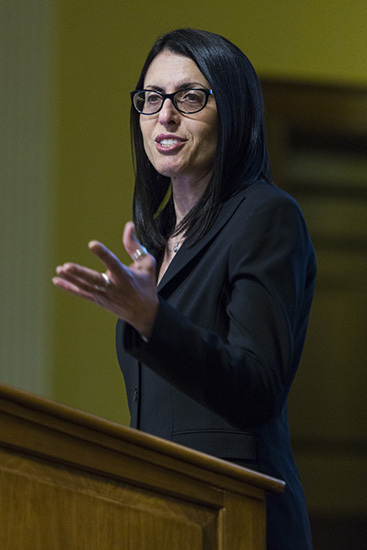 A senior attorney at the D.C. headquarters of Public Justice, Kimmel spoke on a variety of civil rights issues and tort cases dealing with bullying. She reviewed precedent cases and outlined what factors are needed to successfully win a bullying case. Meier, an expert on cyberbullying, spoke on her personal experience with bullying and how she worked to create stricter laws after her 13-year-old daughter committed suicide after being harassed on MySpace. At the time of her daughter’s death, the State of Missouri did not have any established laws to prosecute someone who used electronic communications to stalk or harass another person. Meier worked with her senator and the governor’s Internet Task Force to amend the stalking and harassment law to include electronic communication. Although steps have been taken to protect victims of bullying, all three speakers noted the critical need to increase support for students and victims of bullying in the court of law.